� How was your last visit to Aviv? Aviv Restaurant welcomes you to excellent Israeli and International cuisine, fine wine, and stellar service in bright and spacious surroundings. The consistent quality and attention to detail which maintains Aviv’s status as one London’s most bustling eateries has been honed during twenty five dedicated years as London’s longest established kosher restaurant. Aviv has expanded both in size and scope to meet the growing needs of it surrounding and expanding clientele. 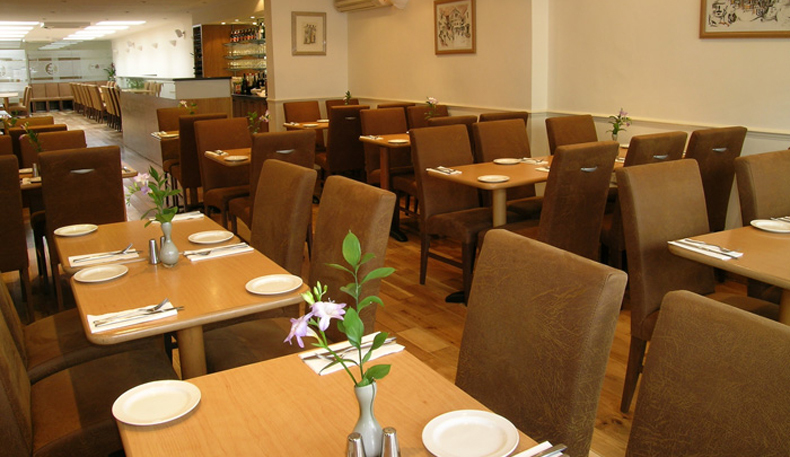 Participating in the establishment of the vibrant community that Edgware has steadily become has played an integral ingredient in the satisfaction gained by all at Aviv Restaurant. Aviv’s team of highly trained chefs provide an eclectic menu ranging from the delights of the Middle East to old heimshe favourites. Their a la carte and set price options offer a high quality dining experience at a reasonable cost. This winning formula is attested to by the number of diners who enjoy the hospitality of Aviv on a regular weekly basis. Aviv provides outdoor seating in the summer months and is the perfect location for a special meal with family or friends. Aviv may be hired exclusively for Wedding’s, Bar Mitzvah’s, and other special occasions. The restaurant will comfortably accommodate up to one hundred guests, while more intimate gatherings of up to fifty guests can be ensconced in our private dining room. Aviv aims to offer you a complete package, tailor made to suit the individual requirements of your celebration. A wide and varied choice of home made speciality dishes are available, while floral arrangements, balloons, table plans, and personalized menu’s are all available from our in house event service. Hours D'oeuvres like Chicken Satay or Houmos with Lamb and Pine Nuts are a good way to start the meal. The T Bone Steak as well as Fillet of Duck or Hungarian Beef Goulash are highly recommended entrees. Excellent meal. Looked after really well by Abdul. Helped us after to order a taxi and showed us to the car. Amazing service ! Throughout the '50s and '60s Safed, one of Judaism's four Holy Cities, was known throughout Israel as a bohemian artsy community which did not attract many religiously‐observant visitors. The Artists Colony included many of Israel's greatest artists of the era including Moshe Castel, Yitzhak Frenel, Modechai Levanon, Tziona Tragger and Moshe Rosenthalis. Travelers note that during those years, it was almost impossible to find a kosher restaurant, with any sort of hechsher, in Safed. By the '70s the old artists were no longer able to open their galleries during the summers and the younger, secular Israeli artists preferred to stay in Tel Aviv. The Artist Quarter became populated by religious families, many from English‐speaking countries, as well as new artists who were religiously observant. Today all restaurants and eateries in Safed are kosher. There are plenty of traditional falafel and schwarma spots in the city but there are also a number of unique eateries which can fit any taste and budget. The Isadora Café is located in the Artist Quarter near the Khan of the White Donkey. The café is an outdoor coffee shop where patrons can enjoy dairy dishes including soups, sandwiches, burekkas, pastas and salads. Isadora opens during spring, summer and fall by 9:00a.m. and closes in the evenings, approximately 8:00p.m. Isadora Café is a sister‐restaurant to the Gan Eden restaurant which is located on Mt. Cana'an, next to the Cana'an Spa. Gan Eden serves a variety of fish dishes in addition to the dairy menu. Gan Eden has won accolades from several Israeli restaurant reviewers. The two restaurants are owned by the same family and both are under the supervision of the Safed Rabbinute. HaAri 8 is located on the ground floor of the Carmel Hotel along HaAri street, the road that skirts the northern border of the Old Jewish Quarter of Safed. The restaurant is small so it can provide patrons with plenty of personal attention. HaAri 8's menu is a meat menu and includes mixed grill, beef steak, lamb shops, goose liver and hamburgers, all of which are served with salads and potatos or chips. Additional menu items include snitzels, kababs, soups, fish and roasted eggplant with tehina. The restaurant has a mehadrin hechsher from the Safed rabbinate. One of Safed's most popular eateries is a unique take‐out spot located amidst the new galleries on Josef Caro/Shlomo Alkabetz Street. Ronen, a Yemenite Jew, opened his eatery several years ago and it has quickly become a favorite among tourists from many countries. Ronen makes his lachuchs fresh so patrons can choose their fillings. The lachuch is a yeast‐based pancake which is lightly fried in olive oil in a cast‐iron pan with traditional Yemenite spices and herbs along with sliced vegetables and grated Safed goats cheese. The lachuchs can be eaten at the restaurant, either in the back or at one of the tables that are set up out on the street. Alternately, it can be wrapped and taken as a take‐out. Ronen uses all mehadrin products, including the local cheese from the Safed Kadosh dairy. The Kadosh family has been making goats and sheeps‐milk cheeses in Safed for over 100 years, ever since the first family members walked to Safed from Morocco in the early 1900s. The dairy sells a variety of local cheeses including soft salty Bulgarian and ricotta cheeses harder cheeses such as those marinated in Merlot wine, camembert cheese and kashkaval cheese. They also sell labana (a creamy sour cheese) and yogurt. Most patrons buy the cheeses by the kilo but there are a few tables and chairs in the dairy where visitors can sit and enjoy a "laffa" (large open pita‐like bread) with labana spread over the bread and fillings of different cheeses and side dishes of stuffed grape leaves and home. I am not sure of the hours but Prime Grill is open during chold hamoed as well. You may want to add that to your database. Yasher koach on this amazing job! If you see below, I have Prime Grill listed as open. They just never send me their hours. I will most deffinatly go back when i visit my clients in new york. I was at T Fusion during Chol Hamoed with my family and i never enjoyed a meal this much on pesach. The cost was nice not to high and very well worth it. Try Taam China, (617-264-7274) at 423 Harvard Street, Brookline, MA. I recommend going to Israel's premier kosher restaurant website, www.Eluna.com, our Israeli partner.